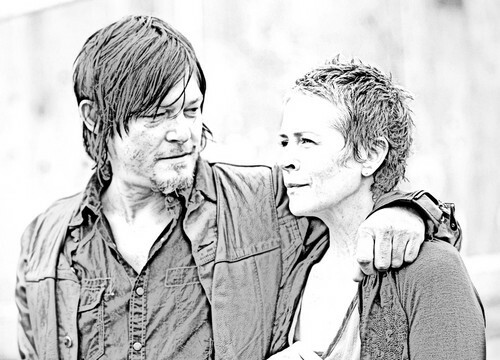 The Walking Dead - Coloring Pages - Daryl and Carol. Copy the ones 당신 want, paste them on a new 8.5x11 inch file, and print to make your own TWD coloring book!. HD Wallpaper and background images in the 워킹 데드 club tagged: photo the walking dead fan art coloring book coloring pages diy black and white daryl dixon carol peletier. This 워킹 데드 fan art might contain 신사복, 비즈니스 정장, 초상화, 얼굴, 근접 촬영, 얼굴 만, 세로, and 헤드샷.